I want to surf Macaronis in the Mentawai Islands more than any other wave on earth. A perfect left starting with a barrel section ending in one of the most rippable waves on earth…what more could a goofy-foot surfer ask for? The thing that is surprising about this wave is that more than just a handful of the world’s best regular footers call it the most fun wave in the world even though for them they have to surf it backside. Right now we all have the rare opportunity to win one of three 8 day/9 night trips to the Macaronis Surf Resort to be taken up any time between February and November 2010. All you have to do is click on the link to the resort, and on the top of their homepage follow the link to subscribe to their monthly newsletter and you will automatically go into the drawing. But as we all know that our chances are pretty slim of actually winning, while you’re on their site check out the special rates they are offering for those that book before November 30, 2009. The package deals at Macaronis Surf Resort sound incredible. This is a surf trip worth looking into. There are a ton of epic surf breaks easily accessed via the speedboats at Macaronis Surf Resort. The speedboats will pick you up at your villa and take you out to surf spots like Macas Right, Bat Cave, Green Bush, Silabu Left, Gilligans, and of course Macaronis. Accessible by the Indies Explorer are Hollow Tree’s, Lances Left, Bintangs, Rags Left, Rags Right, and Thunders. We’ve all seen places like Macaronis and Hollow Tree’s going off in video segments, but check out the video below of Green Bush. Clearly there are a lot of perfect waves within reach of the Macaroni Surf Resort. With so many incredible breaks to choose from, you are guaranteed to find perfect waves with just a couple of guys out. 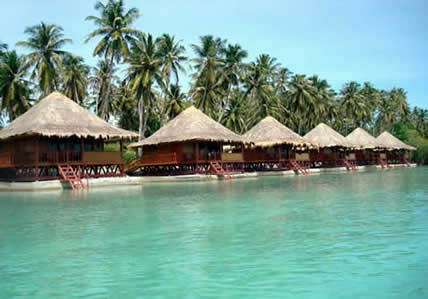 The resort itself looks unbelievable, and will keep you satisfied with plenty to do when you are not out surfing. If you are planning a surf trip to the Mentawai Islands, Macaronis Surf Resort is definitely a place you need to consider.